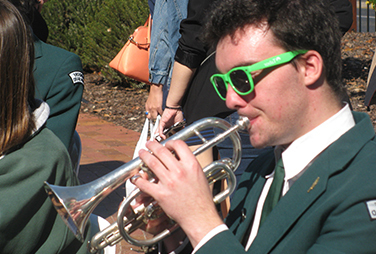 The Band’s aim is to continually develop enthusiasm for brass playing in the Adelaide Hills, and is currently using a three-pronged approach – community, school and adult learning. This method has the potential to involve many people of many ages, backgrounds, levels of expertise and speed of learning. The Band in particular has developed a structured curriculum to teach brass in the hills community. This curriculum covers all aspects of the challenges in teaching young people in individual and group situations, and also connects with local schools through our music. The Band’s current education coordinator is its Musical Director Philip Paine, whom is excited about further developing the Hahndorf Band’s training program. 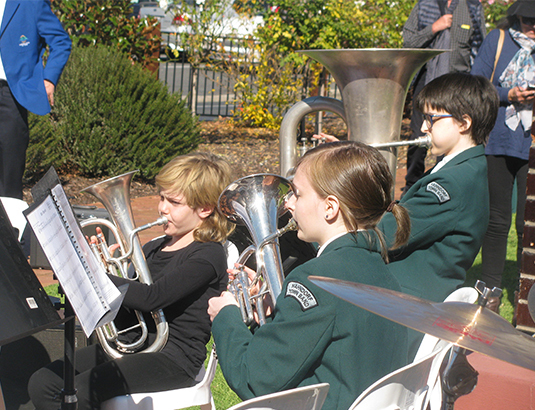 As part of the program, an alliance has been formed with the Hahndorf Primary School, so that all students will be exposed to practical music through brass instruments. Such a program has never before been available in the Adelaide Hills, and involvement has the potential to provide for young people alternatives to sport and less desirable activities. With its commitment to fostering music in the community, the Band is always looking forward to associations with other local schools in the district. The Band is mindful that music competes with a myriad of activities available to youth – music involves ‘hard work and commitment’, which can provide the “double bonus” of success in the short to medium terms, and a good attitude for the world of work and other adult responsibilities. The advantages of ensemble playing in the community are that young people are engaged in a positive, meaningful way; they also have the opportunity to make friendships with other young people with similar interests, and interact and cooperate with a very broad range of ages and abilities. A similar instruction course (in content and structure) for adult beginners is available, appropriate for progression for adults – as more “active young minds” consider early retirement and the life beyond that event, it is very likely that there will be several who have always wished they had the chance to learn music. The Band has the potential to grant that wish, and open up a completely new way of life! A Junior program has been in place within the Band for many years; many of the members often seen performing in the area have risen through the ranks from Junior to Senior Band Players, who serve on committees, play with the complete band or ensembles, march in parades and pageants and enjoy involvement in competitions as a band or as soloists. Enrolment enquiries to any of the education programs should be directed to Program Administrator Kathy on (08)83887280 to secure a place in what can be the beginning of “a beautiful career”. While the curriculum is still subject to ongoing development, orders for hardcopy purchases of the band’s training material can be made on application to the Band President.